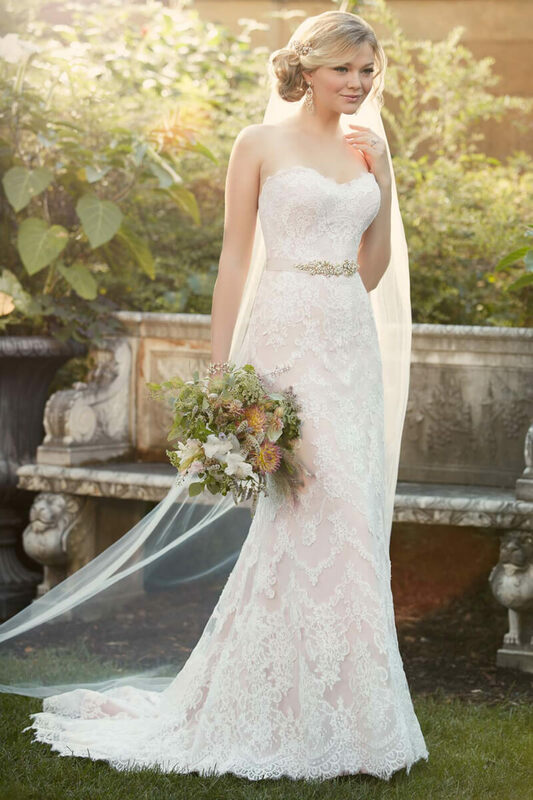 We understand how important it is to have the perfect wedding gown, and our goal is to make sure every bride has a perfect experience while choosing one. When you walk through our doors, you will be greeted with high quality service to make you feel like a princess on this special day. We treat each of our brides like family, and will go above and beyond to make sure they have everything they need to enjoy their time with us. Features a fitted bodice through the waist that gently flows out to the ground, resembling the outline of the letter "A". Ideal for most body types, particularly if trying to disguise a heavy bottom figure. The classic "fairy tale" dress features a fitted bodice that flairs at the waist with a full skirt. Works best for most body types. Not ideal for petites as the skirt can be over whelming on a small frame. A fit and flare gown is the easiest style to pull off, as the skirt sits at the highest point: just below the hip. This will give you that feminine, curvaceous silhouette without restricting your movement or highlighting any lumps and bumps you'd rather not show off. Fits closely to the body throughout and flares out below the knee. Looks best on hourglass figures as it highlights curves, not ideal for pear or round shapes as it accentuates the midsection. Keeps everything lean with a figure-hugging straight skirt that often tightens at the waist. Works best on slim and well-toned figures as it tends to cling to the body. A trumpet silhouette is a perfect midway point between a fit and flare gown and a mermaid dress, as the skirt flares lower down, around mid-thigh to highlight more of your curves, but isn't as dramatic or restrictive as a mermaid. 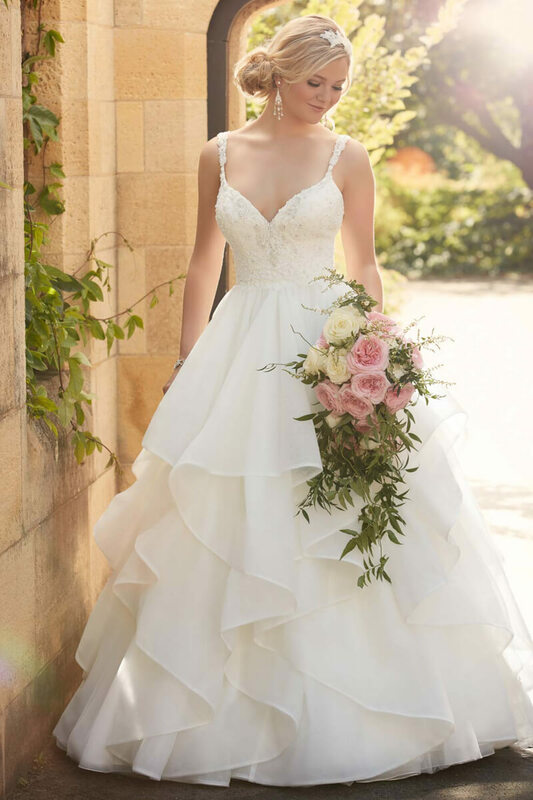 You have most likely been creating the perfect wedding dress in your mind for quite a while, yet we urge you to keep an open mind to try on multiple types of dresses and you just might be surprised at what style flatters you the best. Family & friends often occumpany the bride to these appointments, and while their opinion matters, choose a dress that YOU feel beautiful in! Trust your instincts, but don't fret if your gut isn't talking to you. If you feel great in the dress, walk around in it, sit down in it, do a dance in it, if you can't seem to get the dress out of your mind, but wonder why you're not having more of an emotional reaction- there is nothing wrong with you. You might love a dress- but there are no tears in your eyes. And that's perfectly okay! Once it is your wedding day and you have had an amazing dress tailored to you, you will feel nothing short of magical! Consider the venue and time of year of your wedding. These two factors should play a role when you are finding your gown and the bridesmaid's dresses. We will help you choose a dress that will go nicely with the venue and season, or customize a dress to cater to your individual needs.